MoonMarble.com - Assorted - Game Marbles 5/8"
Bulk Marbles → Target Marbles - approx. 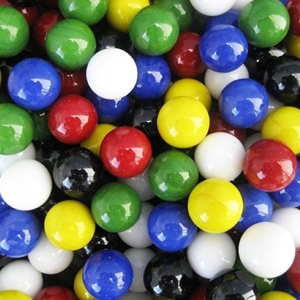 16mm or 5/8" → Solid Colored Game Marbles - 5/8" → Assorted - Game Marbles 5/8"
The 5/8" or 16mm diameter game marbles are opaque glass and may be purchased in assortments of the basic 6 colors. They are also available in assortments of 4 or 8 colors. You will receive 10 marbles of each of the basic 6 colors; red, yellow, green, blue, black, and white. The 4 color and 9 color assortments are not an option for this set. However, you may substitute colors, which you may specify in your order notes. There are approximately 80 - 90 marbles in the 1 pound bag. The number of each color in the assortment will vary. There are approximately 250 marbles in the 3 pound bag. The number of each color in the assortment will vary. There are approximately 500 marbles in the 6 pound bag. The number of each color in the assortment will vary. The 3000 count case contains 6 of the 6 pound bags (approximately 500 count each), which is one bag of each of the 6 basic colors in the assortment. You will receive nearly even numbers of each color. The 3000 count is an approximate amount.